“This is the first direct detection of gravitational waves and the first observation of a binary black hole merger.” This final line of a paper published this morning in Physical Review Letters by the Laser Interferometer Gravitaional-Wave Observatory (LIGO) collaboration sums up today’s press conference announcement. 14 years after their search began and 100 years after Einstein predicted them, gravitational waves were detected. 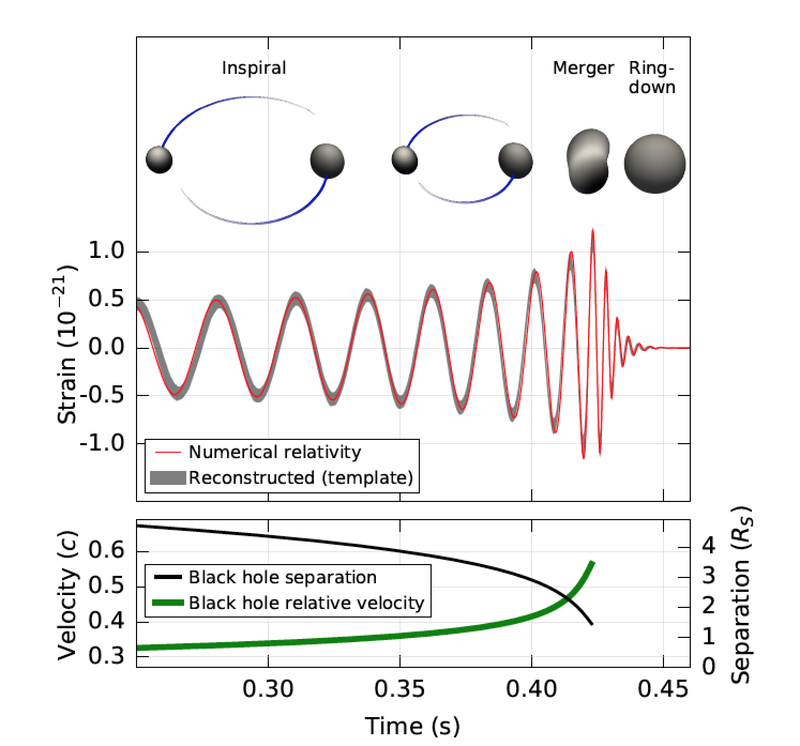 This would be headline news on its own, but LIGO got in a second first, highlighting the “observatory” part of their name: they are the first to observe a black hole merger. And just to add another interesting twist, no one really thought we’d find black holes this size (they are the largest stellar black holes every observed). Let’s hope they have one heck of a bottle of champagne in Hanford, WA and Livingston, LA today. 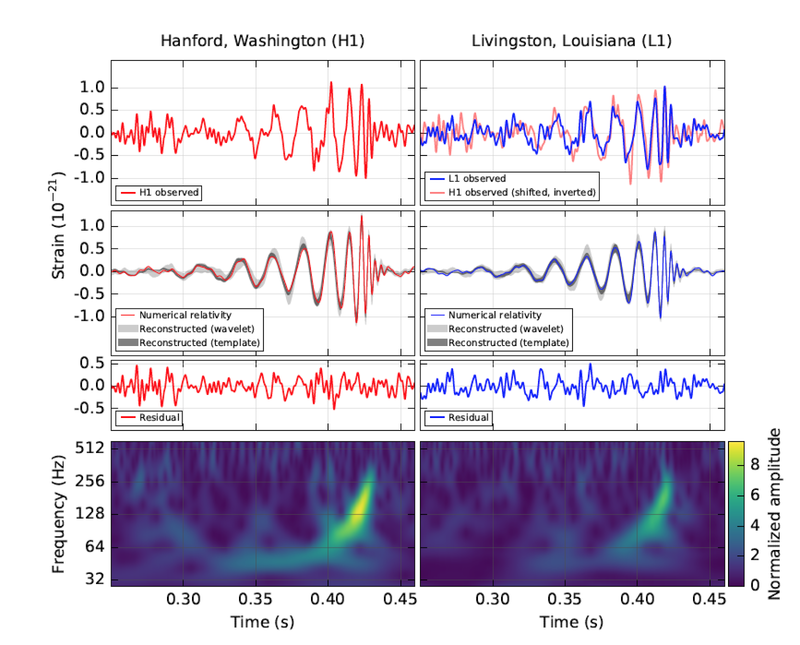 So what exactly did LIGO do and why is everyone going so crazy over it? (We even had an office-sponsored champagne toast at PhysicsCentral headquarters today, so you know it's a big deal!) In 1915, Einstein published his paper on General Relativity. He theorized that we can look at the world not just as three dimensions but as four, with the fourth being time. It's hard to discuss any of this without using a whole lot of analogies and I plan on doing just that, but I’ll try my best not to jump from trampolines to antennas too quickly. Without any mass, space-time would be one long flat sheet. But objects with mass warp that space-time sheet like a kid on a trampoline. And just like with a kid on a trampoline, the bigger the mass, the more space-time is warped. And one of Einstein's huge breakthroughs was that warped space-time affects not just mass, but light, too. Scientists have seen this before through gravitational lensing. 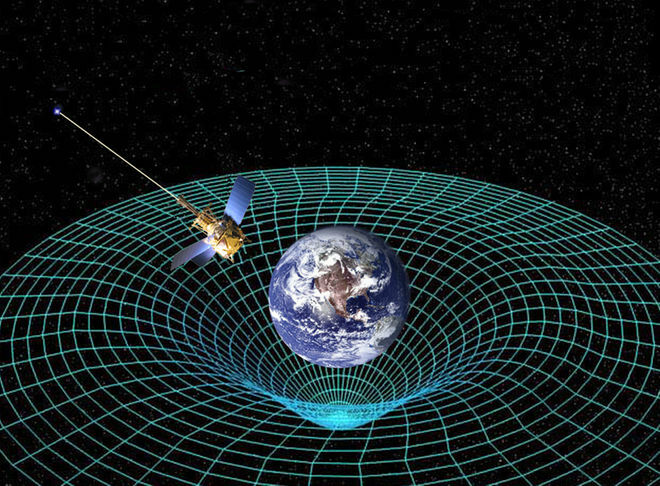 Here is the obligatory picture of the earth warping space-time. Gravitational waves happen when the kid on the trampoline starts jumping, or in this case when two really big kids start jumping. Those "big kids" are two stellar black holes, created when stars collapse, about 30 times the mass of our sun. Before now, scientists were not aware stellar black holes could be that big. As they spiraled toward each other they gave off energy, or bounced on the trampoline of space-time. When they finally collided the released a whole lot of energy, making very strong ripples in space-time, and LIGO was able to detect this. In the trampoline analogy, LIGO sits on the springs on the edge and measures the ripples as they come through. They detected that people were jumping and used how they jumped to determine what the people looked like—the frequency of the space-time ripples detected allow LIGO to figure out the size of the massive objects. General Relativity predicts different frequencies for different types of events. In this case the frequencies they saw could only be explained by two large, stellar black holes. LIGO is a perfection of a very old technology, the interferometer. Because light is a wave, when it interacts with itself it interferes, sometimes destructively and sometimes constructively. The resulting interference pattern can be used to figure out how far the light has traveled. 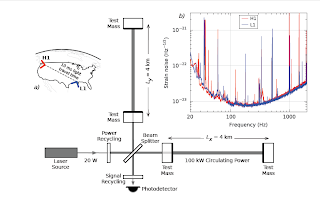 For more information about interference and to use it to measure the width of your hair, see PhysicsQuest: Spectra, the Original Laser Superhero Activity 2. The interferometer was first developed by Michelson and Morley in 1887 to measure the "aether wind" (spoiler alert, there is no aether wind, but there was a Nobel Prize). LIGO's interferometer shines a very powerful laser beam down two perpendicular, 4km long arms, has it bounce of a very, very massive mirrors, and come back together where it started. It's done in such a way that the two laser beams cancel each other out perfectly so a very sensitive light detector doesn't see any signal. But if one of those mirrors moves even very, very slightly the laser light no longer destructively interferes and there's a signal. LIGO is so sensitive that it can measure changes in distance of less than the width of a proton. Because gravitational waves affect very massive things, if one were to pass through the the long arms of LIGO it would even so slightly move the massive mirrors and the light detector would get a signal. The big problem those is that it's not just gravitational waves that move the mirrors, it's pretty much every passing truck. LIGO has the big job of figuring out what signals are trucks and what signals are actual gravitational waves. One big way to do this is to build more than one detector. Any local noise such as earthquakes and crashing waves will only be seen on one detector, not two. For everyone to be sure they saw an actual gravitational wave, each of the two detectors has to see the same signal at the same time. And then to be really, really sure it was a wave, the data go through many layers of removing background noise. It's a complicated process and a science unto itself. 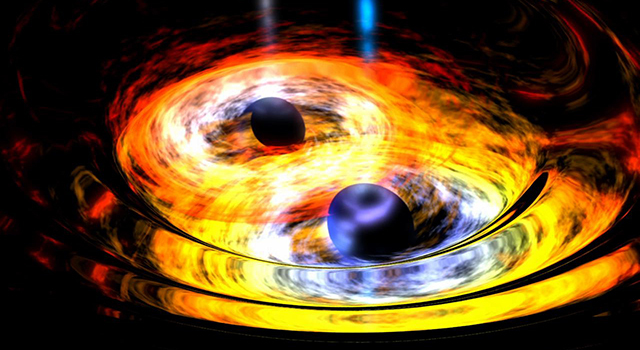 After exhaustive analysis, LIGO scientists confirm that they have indeed seen a wave and that it was created by two stellar black holes merging. Here's the signal they saw. The red line is what they'd predicted it would look like, the gray line is what they actually saw. It's some pretty darn good agreement there. This detection ushers in a whole new era of physics and how we can see our universe. LIGO did something many thought impossible—some didn't think gravitational waves existed and many thought even if they did, we'd never have technology sensitive enough to detect them. But haters gonna hate and LIGO detected both black holes and gravitational waves in one go. We used to just see things with light, now we can see things with gravity. Go LIGO! 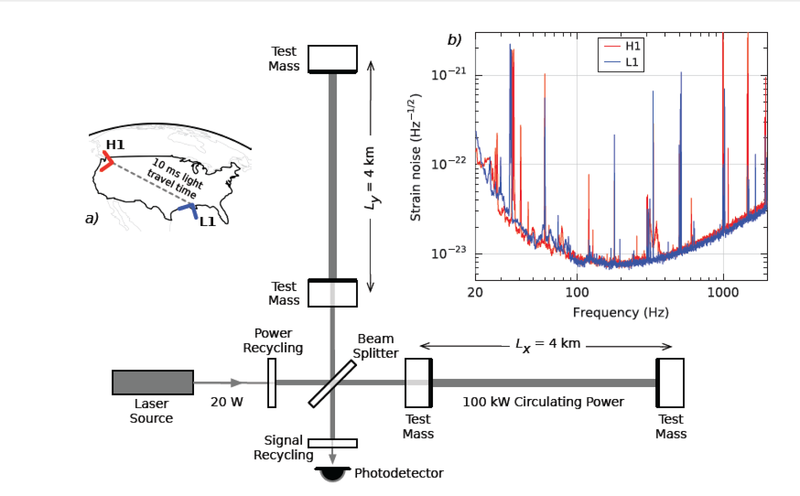 If you'd like to get into more of the heavy physics, APS is providing free access to the LIGO paper here, and a fantastic summary of the findings here. How did they know how long ago the black holes merged? Couldn't they ahve been smaller black holes and just closer? The gravitational wave ripple travelling at the velocity of light passed through earth in a moment. It created a chirp heard by physicists at Laser Interferometer Gravity-wave Observatory (LIGO) at that ‘now’ moment. The hearing was through a loudspeaker transducer linked to LIGO. 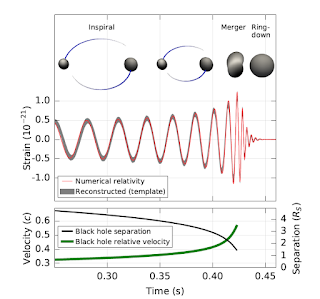 With reference to the ‘present moment now’, the ripple of gravity wave sensed by the physicist was created 1.3 billion years ago by the merging of two black holes in a space. Merging was at a place imagined in the mind of physicist. What is happening at that place ‘now’ will be known by us only 1.3 billion years from ‘now’. Space is said to extend over billions of light years of distances around our bodies which are in that physical space. But, does time exist around us? Does time extend in physical space into a past and a future over billions of years from our present moment which is now? We know our world of yesterday. It is not around our body in a physical space. Past and future of time is in our mind without extension over space. We imagine in our minds black holes and galaxies extending over billions of years into the past and into the future outside our mind in a physical space. We create the past and future only in our minds. Past and future does not exist around the body outside the mind only in the present moment. Past and future of bodies is in the mind, they are not around the body. The creation of past and future of bodies and cosmos is in our minds. The creation is from our scientific predispositions. Knower-physicist is the reality now. Past and future of time are unreal compared to real present ‘now’. The cosmos of physics is a utilitarian model of physicists. It is similar to the utilitarianism models created in economics and politics and other social sciences but much more dependable and accurate. The knower senses, ever in the present moment. Knower knows in the mind by sensing and by predispositions. What is sensed is energy passing through the senses in the present moment ‘now’. Predicted sensing in the future, such as sighting of a comet, implies predictable creation of the energy in the bodily senses in the future. In sciences, reality is ever the creation of energy in the senses of the knower in the present moment. All else is unreal ideas in memory as past creation of energy or as predicted future creation of energy. All energy is a cyclical motion of force with a frequency linked to the cycle. This is the idea called Plank’s law. It applies to projection outside mind. 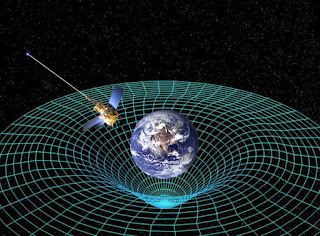 Two cyclical forces which are significant in energy are em wave and wave of gravity. There is no limit to increasing frequency of cyclical un-extended motion. Frequency of energy may be there in consciousness or psychic energy of which faculties of knower and knower-awareness are formed. This is of course speculation about a higher frequency than the frequency of all known forces of matter and energy which are projected outside the mind. The frequency of dark energy is unknown like the frequency of consciousness or awareness. Is there unaware dark consciousness unlike the aware consciousness which we persons are?